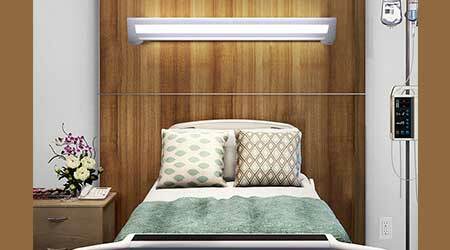 The Remedi LED multi-function bed light strikes a balance between visual comfort and high quality illumination while providing a number of valuable features that improve staff efficiency, patient safety and ease of servicing. Four distinct optical compartments eliminate the need to physically move any portion of the luminaire housing to utilize the key lighting functions. This approach to the overall functional design was supported by input from healthcare professionals who struggled with the physical act of rotating a heavy housing to aim the light at the bed surface. Research showed that often times staff wasn’t even aware that any exam lighting was available, reinforcing the belief that critical patient evaluations were happening without adequate illumination. The ambient and reading recommendations for average illumination and uniformity are met with the dedicated optical compartments. For patient examination, Remedi utilizes a front optical compartment along with the ambient function to create a multi-source of light that reduces direct glare, delivers enhanced uniformity, provides excellent illumination levels and reduces shadows. A molded linear optic is incorporated into the exam compartment to direct light precisely on the bed surface while the ambient source provides a soft indirect contribution. The ambient source is energized when the examination function is engaged. This approach to exam illumination delivers more than 100 average footcandles on the patient bed with a uniformity under 5:1 max:min. Remedi can be specified in one of four color temperatures (3000K, 3500K, 4000K or 5000K) and with either a > 80 or > 90 CRI. A standard antimicrobial finish contributes to the control of hospital-acquired infections. By choosing to design around a solid-state light source (versus converting a fluorescent solution), new opportunities existed to explore new product forms. The sloping contours not only reduce the visual size but precisely position optical compartments to maximize performance. The soft form, subtle transitions between planes and lack of visible hardware further contribute to the clean, architectural appearance of Remedi that is desired for today’s patient rooms. Another departure from the norm is Remedi’s use of an air gap between the optical housing and wire way. This approach provides a lighter overall appearance and presents the opportunity to incorporate an optional, full-length, indirect night light. By hiding the aperture of the night light, there is zero glare, adding to patient comfort. It is available in either 3000K white light or amber (590 nm) to minimize disruption to a patient’s sleep patterns. Another option is the three-way night light switching that offers On/Off and light level control. This control turns on the night light at 25 percent. The light level can then be increased to match the task – ensuring patient comfort and staff satisfaction. Another goal of Remedi is quick installation and easy servicing. A two-piece wire way cover provides clear access to removable gear plates and the end caps have a removable panel that allows simple replacement of LED trays. Critical components can be replaced without the need to remove Remedi from the wall.